Ruwayda Redfearn joined Deloitte as a trainee accountant, there was only one Black partner in the region - and that person was certainly not a woman! This wasn't just representative of Deloitte; the entire profession was very different in 1997. But Ruwayda Redfearn is testament to the dramatic transformation of the accounting world since then. After completing her articles, Redfearn went to Deloitte New York on secondment, a move that opened her world. While she returned to Durban to take up the role of audit manager, she took every opportunity to work on global projects and gained invaluable experience in Germany, Japan, the United States, Singapore, the UK and Spain. "This global experience, and the understanding and appreciation I gained of various cultures, has shaped the person that I am today", says Redfearn. There was no family tradition of success in the profession to pave her way. Neither of her parents had any formal education beyond primary school, but they were nevertheless a big influence on her career, ensuring access to tertiary education and opportunities they had never enjoyed. Redfearn studied at the University of Natal, as it was then known, and when she joined Deloitte, she continued to work hard, raise her hand to take on difficult projects and challenge herself to make her mark on a profession that was transforming. She was appointed partner in 2004 and credits her partners and mentors within Deloitte for much of her success, pointing out "I was lucky to have tremendous support from some wonderful partners in the region". In 2012 Redfearn left the firm to take on a role in commerce, a decision that she says gave her invaluable experience and more opportunity for growth. 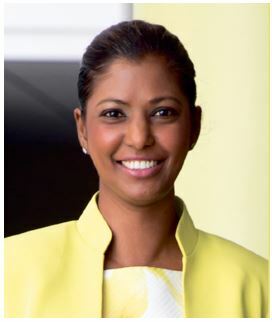 After three years, she returned to Deloitte as regional leader for the KZN region, and she currently also serves on the Deloitte Africa Board and chairs the firm's Remuneration Committee. Redfearn points out that while people seem to think that chartered accountants are little grey men with minimal personality, she has found the opposite to be true. "This is a career where the ability to interact with people from all walks of life, form interpersonal relationships and build a strong network is absolutely key. Fortunately, this has been a strength of mine. But hard work, perseverance and being 'thick-skinned' also helps." She also notes that the courage to step out of your comfort zone and a willingness to be uncomfortable is vital to success. "It's hard taking on new challenges and sometimes you need to face that to speak up and take action. But I believe this ability has contributed to my success." Redfearn is inspired by nature, family, people. Her journey is not a relentless quest for success, but she does strive to live her life to the fullest every day, and take advantage of every opportunity. She also deliberately aims to be a positive influence for others, in the same way others have been for her. "I don't enjoy hierarchy and I like taking people along a journey with me. I believe that I am approachable and hopefully I do inspire people. I enjoy giving others the platform to succeed and get a lot of personal fulfilment in being part of the development of others." One of the highlights of Redfearn's career was chairing the Deloitte Young Partners' Advisory Council in 2008/2009, reporting to the Deloitte global CEO. The Council comprised 27 young partners, each from different countries and Redfearn had the opportunity to lead this diverse team for a year, an experience she describes as "a phenomenal experience in leadership and innovation". Redfearn's family has recently expanded with the addition of her first child and she is currently on maternity leave with the biggest role of her life - being a mom. Redfearn's optimism is tangible. She notes that being a black woman in the profession in the late 90's had its challenges, but in retrospect, she chooses to see it rather as "exceptional experiences for personal development". She also points out that Deloitte is a very different place today, and that the company's transformation achievements bears testimony to that. She's very proud of the growth of the Deloitte KZN region and the firm's contribution to the growth in the province. "KwaZulu-Natal has significant potential that I don't believe that we have even started tapping into as yet." Living by her motto that a society grows great when old men plant trees in whose shade they know they shall never sit, Redfearn strives to plant as many trees as she can.